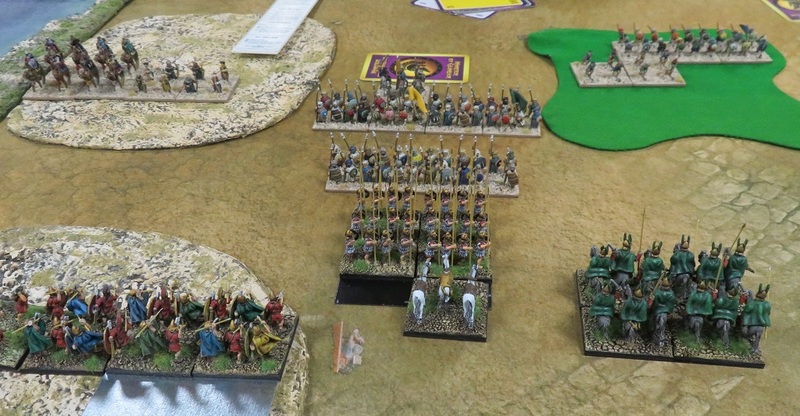 In the last game of the tournament I played against the army of Early Arab Conquest commanded by Steve. I have already played against Steve a few times so far and I learned to be very careful! He is a very skilled player, no wonder he won the last event we both attended, WinterCon 2018. 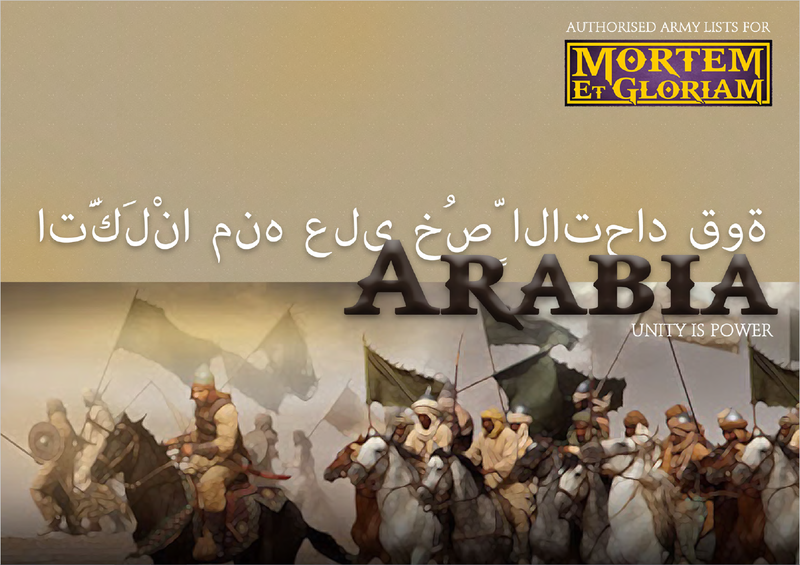 I was not aware at the time of the game about a few significant differences between armies of Arab Conquest from different time periods. 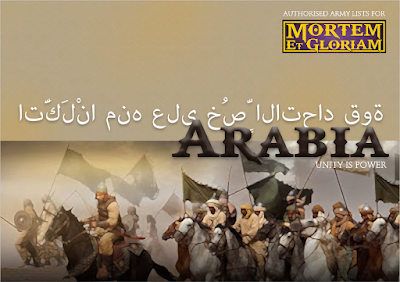 To start with, the commanders can be only Instinctive in the Early Arab Conquest. Then the units are mostly Tribal. In theory that should impact the efficiency of maneuvering of such force. Despite a few games we had before, I am still trying to figure out how to play against this force. Superior Warriors with Integral Shooters counter Phalangites well. 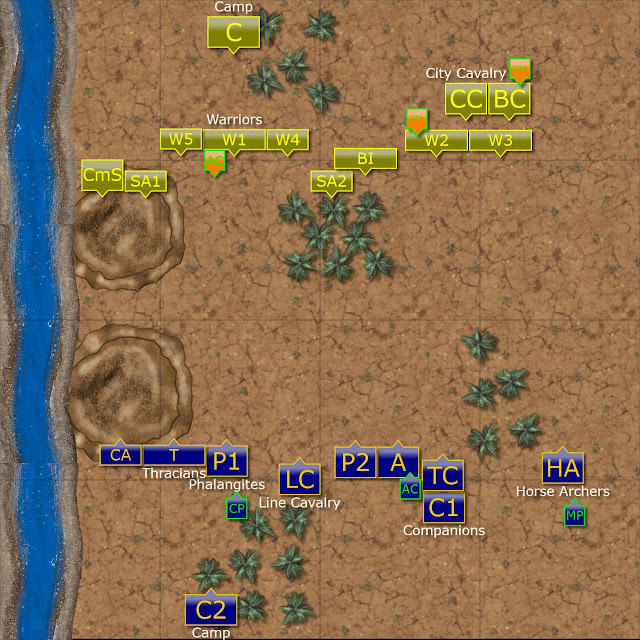 And since there are more units of those I may have trouble once stuck in combat with protecting the flanks. The number of cavalry units was similar but it didn't seem like I have much of advantage in that department either. The initial plan was to follow the usual pattern. Try to get coastal line to narrow the battle field and obtain secure flank for the camp. Then get some terrain pieces to be able to protect the opposite flank and look for the opportunities to exploit. Here are the details of my army list for reference. I managed to keep the coastal line for the battle field but at the same time we also got quite a dense terrain, with no less than 8 terrain pieces. Mainly some sand dunes next to the coastal line and some woods scattered here and there. I believe we did not really out-scout each other this time but I still kept guessing where Steve's units would be and what is the exact composition of his army. 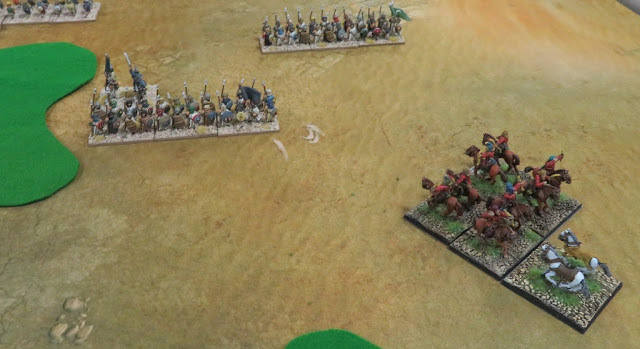 In order to protect my left flank, I deployed Thracians and Cretan Archers at the sand dunes with Phalangites nearby. Line Cavalry was positioned in the center. Then remaining two TuG's of Phalangites on the center-right. I had a dilemma how to deploy the rest of the cavalry. On one hand I was considering deploying Companions and both SuG's of skirmishers on the right flank. However, not knowing what units are going to be deployed where by my opponent, I decided to maintain tighter formation. Steve was an invading player and his was the first turn. Both armies were quite cautious in their respective approaches. Seleucids did not want to move away from the area where their flanks were protected. The woods in front of them also were not favorable terrain for the pikemen. While their opponents approached only on the open flank with cavalry and some infantry units. Horse Archers prepare to harass the enemy. Both armies kept sending skirmishers and only a few elements forward with main bodies stationary and seemingly not eager to fight. The Seleucids' mounted skirmishers were now in range to shoot at the approaching enemy infantry. Shy maneuvers on the flanks continue. Companions on the way to intercept enemy cavalry on the flank. As the enemy cavalry started to outflank and threaten the skirmishers, Companions skillfully turned around and moved to intercept the foe. 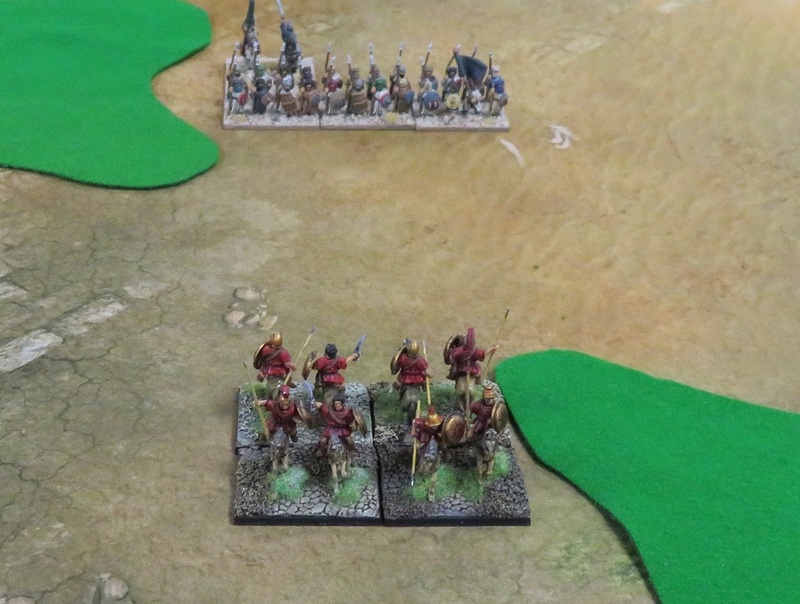 Mounted skirmishers kept shooting at the advancing infantry but with not much success. Phalanx on the move at last. Finally both armies moved with a bit more enthusiasm. Both battle lines moved towards their opponents, with majority of action still taking place on the flank. Once again, Seleucid skirmishers tried to inflict some damage but still with much of an effect. Units of both sides tried to maneuver to get into advantageous positions. Finally the close proximity of the enemy forced both sides into situations where fight was inevitable. Units of the both armies prepared to charge each other. Turn 6 - Sequence of Actions. (Edit: Once again, due to running out of time, we focused only on what we thought to be essential elements of the last turn and we did not move other units). On the left flank, Phalangites and Line Cavalry coordinated an attack against enemy Warriors. 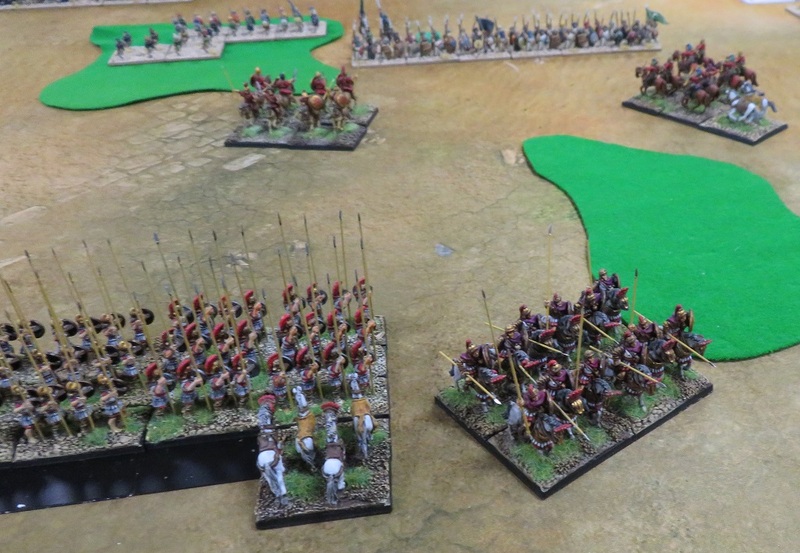 Unfortunately for Seleucids, Line Cavalry was not able to avoid the difficult terrain completely nor another unit of Warriors. As a consequence, the lancers suffered significant casualties and were eventually routed. Phalangites kept fighting but their ranks were also thinned down fast. City Cavalry charged the Horse Archers and managed to catch them as well. In the end, Seleucids withdrew in good order to avoid any further unlucky casualties. Many thanks to Steve for another game! It seems we still cannot get to the definitive result for our battles. I was a bit surprised that his army is not moving towards mine as it used to in prior games but I guess that is the effect of having instinctive commanders, tribal troops and not great cards. 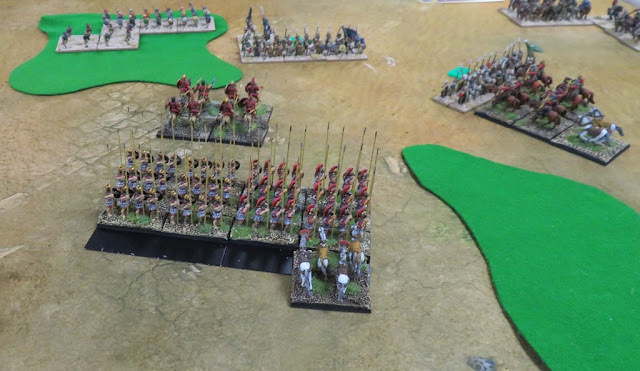 I hoped my own skirmishers could do some damage to the infantry but Superior Warriors were hard to damage, especially that I could not use Cantabrian against them. I even formed the units like that but then it turned out it does not have any effect anyway. Due to terrain placement I could not really advance into good positions until the enemy approached. A pity then that I did not properly position my Line Cavalry for a more powerful flank attack. Instead I had only one file to fight with and did not get sufficient damage while second unit of Warriors did quite a lot. At the same time in the even fight between Phalangites and Warriors it was down to who can roll better on green dice. And as soon as I lost one rank the Phalangites became Long Spearmen and could not perform usual grind as I could do in the previous games with Phalanx starting in full number of bases. First of all, I would like to thank Dean for organizing the event. It was great to see the number of attendance doubled in comparison to the first MiniMeG that was run several months ago. I hope the popularity of Mortem Et Gloriam will keep growing and that the new players had good experiences during the event. I promised to share my impressions about the tournament and Magna version of MeG rules. I wanted to present the battle reports first, however, so that there is a better context for my conclusions. In addition, I think it is always good to back opinions with some evidence, so that the feedback is more constructive. The tournament was run smoothly and without any major problems. The venue is great and it is fantastic that Canberra Regional Wargame Group opened their doors for MeG players. In my understanding, the idea of the event was to invite new players so that they can learn the rules from more experienced ones. I think it worked in general as I remember from my first MiniMeG that it was greatly beneficial to have someone to explain the rules better for me. We had approximately 2 hours allocated for the game and we played 3 games. The assumption was, I think, that with experienced players helping new ones and with 7000 armies per side the games should go quicker. In addition, Magna rules are designed to reach the decisive point of the battle faster as the units, in general, are smaller and should break faster. These elements seemed to take the similar amount of time regardless of the size of the game. One has to consider type of the opposing army and what terrain may be beneficial in this particular battle. It may be quite difficult task for new players in particular, as different terrain types have often quite specific rules. In my opinion, it takes considerable experience to know what terrain to choose. In fact, I think I'd better make that decision prior to any game and simply equip myself with a few pieces of the terrain I want to use. I noticed that deployment may take considerable time for me because of a few reasons. First, I noticed that there seem to be no habit among the players to exchange army lists prior to the battle. What is more, I sometimes do not even know how many units and what type (i.e. infantry, cavalry etc.) are in the opposing army. As there are also multitude of armies out there, I am simply deploying my army without any knowledge whatsoever about the opposing force. Naturally, it will take much longer for me to deploy, I may deploy more conservatively and in the end, that may result in much more cautious approach to the game. 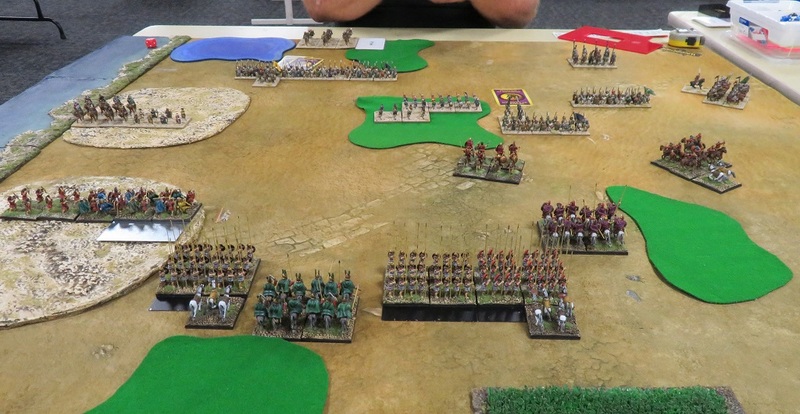 It would have helped me dramatically (as I am sure would any new player in particular) if I could spend 5 minutes with my opponent running through each others army list. I don't think I would gain any advantage against an experienced player in doing so. It would, however, make my deployment quicker and perhaps lead to a more interesting game that would be concluded in a reasonable time. Due to the fact that Magna reduces number of bases for the units, my army did not have fewer elements to command. I actually had only two TuG's and one commander less than the version of the army at 10,500 points under classic MeG rules. It meant that I probably spent similar amount of time maneuvering the army, that is significantly smaller in terms of point cost. I also noticed (and I will expand on that a bit later when I am going to talk about Magna specific impressions) that I am more reluctant to commit the units due to their smaller size. It seemed to me then that with similar number of units but more cautious approach, the time dedicated to decision making was the same. I think it was great that we made the experiment and played all games of the tournament under Magna. It promised to get some experience and provide feedback about this version. Although I have not concluded my games, I wanted to share my impressions, I hope they can be useful. I mentioned above that it felt that I fielded quite similar army in terms of number of elements and that it did not necessary led to quicker game. When combined with more reluctant approach due to concern for how quickly these elements can be broken, it resulted in games that were far from completion. In my prior games the units were often committed to fights in 3rd turn and melee erupted across entire battle field. Here you could see that sporadic engagements were in 4th turn. Even in the 2nd game the battle lines properly engaged in turn 4 and we simply run out of time to continue. Another observation I made was that the same units may not necessary play the same role under Magna. For example, I learned that Phalangites lose their claims much quicker than normally. It means that I was less inclined to commit them to the fight to pin down and possibly even grind down the enemy a bit. Even with a combined attack from the flank with the cavalry it was not successful and backfired. Even though we did not have many games that were concluded in time, I think the tournament was a very important experiment. I am very happy I took part in it and I am sure that the experiences gained will help to organize even better events in the future. If MiniMeG is going to be a regular type of event aimed to introduce new players to the game, I think regular rules at 7000 with 3 hours per game (as during the first tournament) would be a better option. There would be less elements to command per army so it should be easier for new players to learn how to maneuver and fight with them. And there would be more time to conclude the game. Besides, even more experienced players in general seemed to have very little in playing Magna version. In a way, this even was full of new players! Magna version of the rules is certainly interesting approach. However, I think I would prefer to stick to the classic version. First, because it didn't really seem to go that much faster and I'd rather keep playing under the same rules. There is never enough games to master them, so every battle counts! Second, due to the fact that the same units may need to fulfill different roles, it looks to me that Magna is rather a different game running on the same engine. In terms of a MeG version for quicker plays I am looking forward to trying Pacto at some stage instead!